Prepare to feel old... Camp Rock premiered exactly 10 years ago today. The anniversary took even Kevin Jonas by surprise, who recently caught up with E! 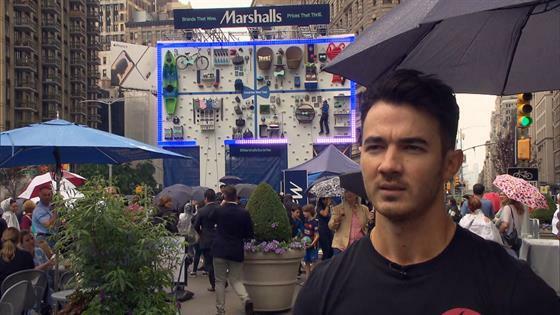 News at Marshalls' Father's Day event in New York City. Calling the milestone "crazy" and "amazing," the former boy bander weighed in on the possibility of a third addition to the wildly popular Disney Channel Original Movies franchise. "Never say never," Kevin shared, revealing that the Jonas Brothers were at one point in talks to bring Camp Rock back to life. "We talked about it for a minute," the 30-year-old said, adding, "doing something ridiculous like an R-rated version now in our life, like a going back to camp kind of thing." For those of us who grew up watching Mitchie Torres (Demi Lovato) and Shane Gray's (Joe Jonas) love story unfold on the small screen, we'd love to see how everyone ended up a decade later. Kevin said he would "definitely consider" another Camp Rock sequel, explaining, "It just has to be the right thing. I can't believe 10 years has actually passed. It makes me feel like I'm getting old." Joe previously said he's on board with an R-rated version of the DCOM, telling Marie Claire in 2017, "If it made sense, sure. For all of us—Demi, Nick, it would be funny to do a spin on it. Do the graduating days, make it kinda dark. An adult film." As the third highest-viewed DCOM history, something tells us the world would benefit from a little Camp Rock magic. For more from our interview with Kevin, press play on the video above!